1. MIAMI (FLA).- A second look at a tusk and tools unearthed from an underwater archaeological site in Florida has revealed that people migrated to the Americas almost 1,500 years earlier than previously believed, researchers said Friday. The site -- known as Page-Ladson -- is submerged 26 feet (eight meters) in a sinkhole on the Aucilla River near Tallahassee, and was first explored in the late 1980s and 1990s. Back then, researchers found a mastodon tusk and several stone artifacts that radiocarbon dating showed to be more than 14,400 years old, far older than the remnants found from the Paleo-Indian Clovis culture in North America which tend to be about 11-13,000 years old.But their findings were largely dismissed by scientists. This "was an impossible age for the scientific community to accept at the time because it was well-accepted that the Americas were colonized by the Clovis people who arrived on the continent over the Bering Land Bridge no longer than 13,500 years ago at the oldest," said Jessi Halligan of Florida State University. Halligan led a team that returned to the underwater site from 2012 to 2014 for more excavation work at what experts say is the oldest archaeological site in the southeastern United States and the oldest submerged one yet discovered in the New World. Working in dark and murky conditions, they found more bones and a biface stone knife used for butchering, and confirmed -- with 71 new radiocarbon dates from the site -- that the artifacts date to about 14,550 years ago, according to the report in the journal Science Advances. 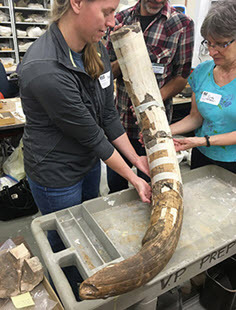 Researchers also re-examined the mastodon tusk and agreed with the original team's conclusion, that deep grooves in the surface were cut marks made by humans using stone tools to remove the tusk from the skull. Hunter gatherers in the area were likely using their stone knives to process the mastodon carcass, perhaps to get at the edible tissue inside, researchers said. Their findings also suggest that people did not hunt mastodons to extinction as quickly as some have believed, and likely co-existed for some 2,000 years. "The evidence from the Page-Ladson site is a major leap forward in shaping a new view of the peopling of Americas at the end of the last ice age," said co-author Michael Waters of Texas A&M University. "For over 60 years, archaeologists accepted that Clovis were the first people to occupy the Americas around 13,000 years ago. Today, this viewpoint is changing." Page-Ladson is among a handful of archeological sites that suggest human occupation from more than 13,000 years ago -- including in what is now Texas, Oregon, Washington, Pennsylvania and Wisconsin. "Because the Page-Ladson site provides unequivocal evidence of human occupation that predates Clovis by over 1,500 years, the side contributes significantly to the debate over the timing and complexity of the peopling of the Americas," said Waters. Page-Ladson is also about the same age as the Monte Verde site in Chile, suggesting that people were living in both hemispheres of the Americas by 14,500 years ago, Waters added. 2. 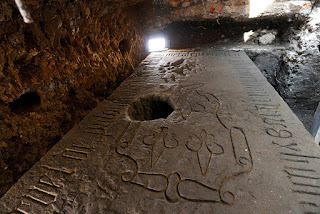 MEXICO CITY MEXICO CITY (AFP).- Engineers installing lampposts in Mexico City's historic center have discovered a stone slab covering the tomb of one of the first Catholic priests following the 1519-1521 Spanish conquest. conquistador Hernan Cortes ordered the cathedral's construction in 1524. The stone was found four feet below street level with the priest's name on it along with three fleurs-de-lis, flowers symbolizing the Dominican order. The stone includes texts in Greek and old Spanish. 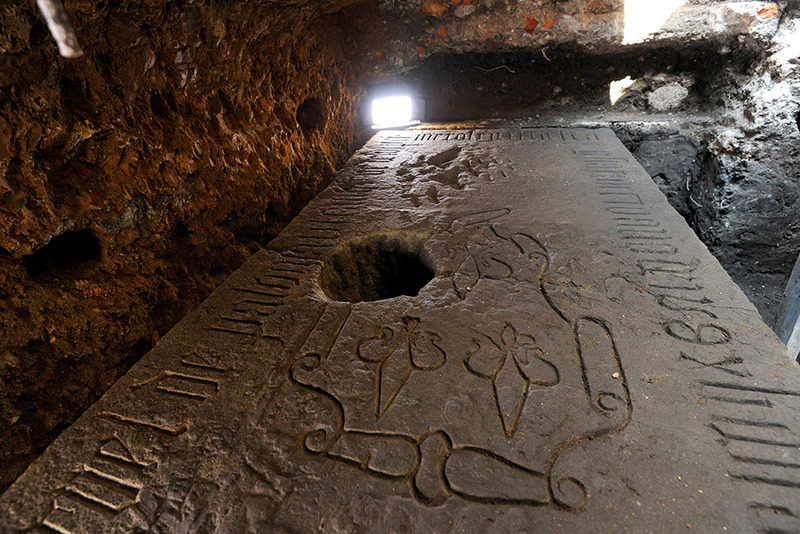 The institute believes the tomb still holds the priest's remains and that its discovery could shed light on his era's burial rituals as well as the diets of Spanish conquistadores. The engineers found the stone in recent days after digging eight inches deeper than planned when placing one of eight lampposts that will illuminate the current cathedral. The stone is fractured after it was accidentaly struck by either a post or a large cross a couple centuries after the tomb was installed.